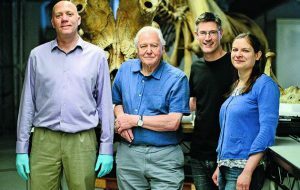 Holly Miller discusses her recent work with Sir David Attenborough to investigate the life of a nineteenth-century elephant. “were pitied by thepeople when, after being wounded and ceasing to fight, they walked about with their trunks raised toward heaven, lamenting so bitterly as to give rise to the report that they… were calling upon Heaven to avenge them” (XXXIX.38). As Pompey was stabbed to death seven years later, perhaps they were. Elephants never forget, after all. These lessons from the Classical writers are particularly poignant given the current plight of the elephant , and the archaeological story of our human-elephant interactions is not just about the ancient past, as I showed in “Attenborough and the Giant Elephant” on BBC One yesterday (December 10th 2017). Jumbo is perhaps the most famous elephant in the world. His name is now used as an adjective to describe everything from passenger planes to packs of toilet roll. Born in Sudan in 1860 he was captured as a calf and transported to a zoo in Paris, before arriving at London Zoo in 1865 as their first African elephant. 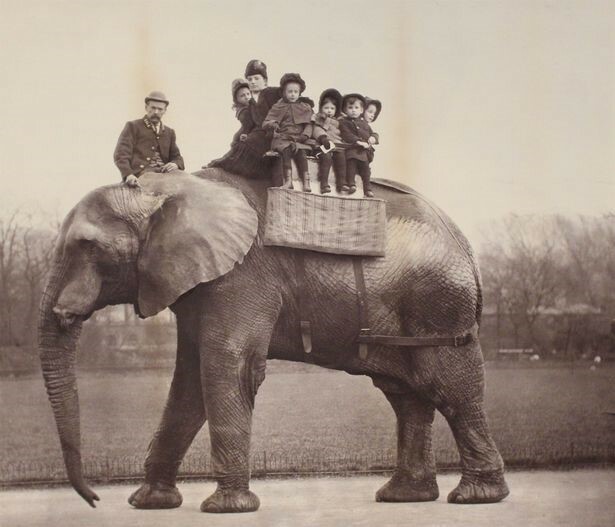 Whilst at London he became the pride of the Zoo, often giving rides around the city to children. Jumbo became increasingly aggressive as he reached sexual maturity and the zoo took the controversial decision of selling him to Barnum and Bailey’s travelling circus. 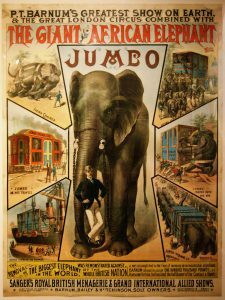 Despite major public protests, a petition, and an outbreak of Jumbo-mania, Jumbo was eventually shipped across the Atlantic, arriving in New York to great fanfare in 1882. In America he became centrepiece of the Greatest Show on Earth, a travelling circus that traversed the length of the US and Canada. Unfortunately, Jumbo died in tragic circumstances: contemporary accounts describe that he was hit by a train while crossing the track to reach his carriage, possibly saving a younger elephant in the process; however, several stories emerged at the time suggesting that his death may not have been an accident. We investigate these events in the programme – I was performing isotope analysis on Jumbo’s bones and tail hair, looking for clues as to his diet and management. Regardless of the results, his story is both captivating and tragic. To film we spent a week working at the American Museum of Natural History in New York and a day at the British Geological Survey in Keyworth. Working with presenters David Suzuki (CBC) and Sir David Attenborough (BBC) has unquestionably been a highlight of my career (and life), not to mention getting to work with Jumbo. Rest in peace, big guy.